Celiac disease is common in patients with type 1 diabetes. Understand the genetic link between these conditions and ways to counsel clients and patients. A type 1 diabetes diagnosis demands major lifestyle changes that include dietary modifications, regular physical activity, and a strict medication regimen. A celiac disease diagnosis also requires significant lifestyle changes that involve eating a gluten-free diet. Each disease is tough to manage on its own, but if both are diagnosed, either simultaneously or years apart, life for clients and patients can become even more complicated. However, RDs can help clients manage their diabetes and celiac disease as they follow a healthful gluten-free lifestyle. The American Diabetes Association (ADA) reports that about 1% of the US population has celiac disease, while an estimated 10% of individuals who have type 1 diabetes also have celiac disease. Several studies have explored the possible connection between these two disorders. The Environmental Determinants of Diabetes in the Young (TEDDY) study, begun in 2002, is tracking nearly 8,000 children in Europe and North America, investigating possible triggers for type 1 diabetes, including celiac disease. Jill Norris, PhD, MPH, chair of the Colorado School of Public Health department of epidemiology and one of the study investigators, says the TEDDY study is screening for celiac autoimmunity because of the risk of type 1 diabetes in those diagnosed with celiac disease. She also believes that type 1 diabetes and celiac disease share a genetic marker and says the TEDDY study is looking for shared environmental factors, including dietary factors. Is There a Link With Type 2 Diabetes? While research suggests an association between type 1 diabetes and celiac disease, there doesn’t appear to be a link between celiac disease and type 2 diabetes, as the latter isn’t an autoimmune disorder and doesn’t share genes with celiac disease. According to the Celiac Sprue Association, individuals can be genetically predisposed to type 2 diabetes, but those genes don’t increase the risk of celiac disease. “Researchers have done epidemiologic studies that look at whether certain traits, like having celiac disease, are higher in a particular population, such as those with type 2 diabetes. These studies have found that there doesn’t appear to be an association between celiac disease and type 2 diabetes,” says Erika Gebel Berg, PhD, an associate editor of Diabetes Forecast. Type 1 diabetes patients with celiac disease who eat a gluten-free diet won’t only feel better, but they’ll also experience more stable blood sugar readings. In those with celiac disease, gluten prevents the absorption of carbohydrates in the intestines, which often causes unexplained blood sugar highs and lows, explains Linda Reineke, RD, CDE, who works with patients with type 1 diabetes and celiac disease as part of the University of New Mexico Hospital diabetes program. Other food components also affect blood sugar fluctuations when combined with carbohydrate intake. For example, fat slows digestion. “Sometimes foods are absorbed, sometimes not, depending on how mixed the meal is,” she explains. It’s important to remember that even after a celiac disease diagnosis and transition to a gluten-free diet, clients and patients still may experience blood sugar fluctuations. Their intestines are beginning the healing process, and carbohydrates are being readily absorbed. In addition, if clients and patients are eating processed gluten-free products that tend to be low in protein and fiber and high in carbohydrates, they may experience blood sugar increases. Most clients with type 1 diabetes have been taught how much insulin they need to take to coincide with carbohydrate intake. But the formula they use may not be appropriate once they begin eating gluten-free foods, so they’ll need to reassess insulin needs and frequently check blood sugar levels. Eliminating all gluten-containing foods from the diet can complicate most aspects of living with type 1 diabetes, though. Patients with type 1 diabetes count carbohydrates before eating meals and snacks and then balance them with the correct insulin dosage. They also consider their protein and dietary fiber intake. This poses a challenge because many processed gluten-free foods are high in carbohydrates but low in protein and fiber. To address this, Rondinelli-Hamilton says clients and patients should eat naturally gluten-free whole foods such as vegetables, fruits, lean meats, legumes, and quinoa. Not only are these foods better sources of carbohydrates, but they also contain more protein and fiber than processed foods. 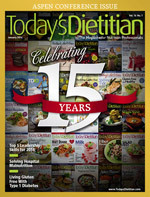 To help clients and patients adjust to the lifestyle changes that accompany a dual diagnosis of type 1 diabetes and celiac disease, dietitians can, for example, teach those who occasionally eat processed gluten-free products to count carbohydrates and especially pay close attention to carbohydrates in gluten-free grains, says Shelley Case, BSc, RD, author of Gluten-Free Diet: A Comprehensive Resource Guide. Grains such as wheat, barley, and rye contain gluten, but it also can be found in bulgur, durum, semolina, spelt, kamut, einkorn, faro, triticale, couscous, farina, malt, and seitan. Moreover, gluten may be hidden in ingredients such as vegetable protein/hydrolyzed vegetable protein, starch/stabilizer/vegetable starch, modified starch/modified food starch, natural or artificial flavors, caramel color, seasonings or flavorings, dextrin and maltodextrin, and oats. Oats often are contaminated with gluten as they grow or are harvested, stored, or processed, so it’s important for clients and patients to buy those that are labeled gluten free. To increase their fiber intake, clients can add nuts to gluten-free cold cereals and flax to gluten-free oatmeal. Case also recommends adding kidney beans, black beans, or chickpeas to gluten-free pizza or baked potatoes. Gluten also can be found in prepared food products such as soy sauce, ice cream, candy, herbal teas, canned soups, lunchmeats, and salad dressings. It’s found in personal care products such as toothpaste, mouthwash, lip balm, and lipstick and is used as a filler in many oral medications and over-the-counter products. Some varieties of these products are gluten free, so clients and patients should look for labels indicating this or contact manufacturers, speak with a pharmacist, or go online for needed information. Ultimately, education is the key to living successfully with type 1 diabetes and celiac disease. Clients and patients need to become knowledgeable about both diseases and how to manage them through physical activity, medications, and nutritious gluten-free foods that fit into a diabetes-friendly meal plan. When providing medical nutrition therapy to patients, Reineke advises dietitians to discuss the different food groups, spend time listening to patients, take their individual eating patterns and lifestyles into consideration, and substitute nutritious gluten-free options for the foods they normally eat. With a dietitian’s guidance, patients with type 1 diabetes and celiac disease can make healthful gluten-free food choices. Effective dietary counseling should result in better nutrition and better diabetes management. Dietitians are in the best position to help these patients establish a foundation for gluten-free living by providing patients with educational materials and scheduling follow-up appointments so they can achieve optimal health. — Karen Meadows, MA, MS, CDE, is a freelance writer in New Mexico who lives successfully with type 1 diabetes and celiac disease. • Use gluten-free bread crumbs when preparing meatloaf. • Choose corn, rice, or multigrain gluten-free tortillas instead of wheat tortillas. • Eat polenta instead of pasta. • Include quinoa, millet, and buckwheat as part of meals. • Wrap a turkey burger in lettuce rather than a bun. • Thicken sauces with arrowroot, cornstarch, guar gum, kuzu, or tapioca starch. 1. Barera G, Bonfanti R, Viscardi M, et al. Occurrence of celiac disease after onset of type 1 diabetes: a 6-year prospective longitudinal study. Pediatrics. 2002;109(5):833-838. 2. Smyth DJ, Plagnol V, Walker NM, et al. Shared and distinct genetic variants in type 1 diabetes and celiac disease. N Engl J Med. 2008;359(26):2767-2777. 3. Ziegler AG, Schmid S, Huber D, Hummel M, Bonifacio E. Early infant feeding and risk of developing type 1 diabetes–associated autoantibodies. JAMA. 2003;290(13):1721-1728. 4. Kabbani TA, Kelly CP, Betensky RA, et al. Patients with celiac disease have a lower prevalence of non–insulin-dependent diabetes mellitus and metabolic syndrome. Gastroenterology. 2013;144(5):912-917. 6. Celiac disease — complications. Mayo Clinic website. http://www.mayoclinic.com/health/celiac-disease/DS00319/DSECTION=complications. May 22, 2013. Last accessed November 2013. 7. Schwarzenberg SJ, Brunzell C. Type 1 diabetes and celiac disease: overview and medical nutrition therapy. Diabetes Spectrum. 2002;15(3):197-201. 8. Evert AB, Boucher JL, Cypress M, et al. Nutrition therapy recommendations for the management of adults with diabetes. Diabetes Care. 2013;36(11):3821-3842. 9. Checking your blood glucose. American Diabetes Association website. http://www.diabetes.org/living-with-diabetes/treatment-and-care/blood-glucose-control/checking-your-blood-glucose.html. Last edited July 19, 2013. Accessed November 2013.